The design of the site was updated a few weeks ago, bringing the latest incarnation of equivocality.com to version 13. I thought version 12 was going to be the final design, but I’ve realized that things inevitably change in my life, and the site is always ends up being a reflection of those changes. At least it lasted over a year, which is more than I can say for any of my previous designs. After going through a period where I felt shattered and began to question everything that was important to me, I knew I had to redefine myself. It made me want to strip everything down, and go back to my ultra-minimalist roots, while borrowing a few much-loved elements from previous designs such as fine dotted lines. All the code has been built from the ground up instead of being based on a previous theme. Now there’s only one column, with everything centered to keep it all nice and simple. This lets me post very large pictures, which I’ve really been enjoying lately, and something the previous theme had restricted me from doing. The pictures scale nicely though, so people with low-resolution monitors will still be able to see an entire photo without ever having to scroll. One of the biggest changes from any of my previous designs is the use of a non-system font for body copy. I wanted to move away from the Helvetica I’ve been using for so long now and give the site a unique feel. I decided on Proxima Nova, which retains humanistic proportions with a somewhat geometric appearance. I’m still frustratingly disappointed by the current state of web typography, so I’ve turned to Typekit to take care of that for me. Wu Wei, my free WordPress theme, is currently the 5th most popular theme on WordPress.com, with over 550,000 blogs using it at the moment (not including ones being self-hosted), and it’s become so successful that the administrators have made it one of the default themes for new sign-ups. By far the most common support question I get is why the WordPress.com version isn’t available for WordPress.org users (some have even offered to pay for an update), so I’m very pleased to announce the release of version 2 for self-hosted blogs. The theme has been updated to take advantage of new features that came with WordPress 3.x, such as custom header and custom background APIs, custom menu management, as well as various under-the-hood fixes and improvements. Tags and comments have also been included on the front page, to bring better standardization across WordPress.com and WordPress.org versions. People have asked me why I don’t charge for such a theme, seeing as how I’ve poured a tremendous amount of time and energy into something used by so many people. I can only say that Wu Wei has brought me much luck since its release, and thanks to it’s popularity, I’ve met many great people1, received new design work, and even had a chance to visit Britain — things I don’t think would have been possible if Wu Wei was a paid theme. Version 12 has been retired here. equivocality.com is now running version 12, in what I suspect will be the final design iteration for this site1. I’ve been itching for a new look for a while now, around the time I was in England, something that was reflective of the peace I’ve made with myself and the world. Life no longer feels like a draft where I’m trying to figure things out, so I’ve abandoned the beloved graph paper background which debuted in version 9. Most elements and text have been toned down a bit2 to give things a slick, clean, and polished look, very much inspired by Jin Yang’s blog. I’m still in love with the large single-column layout that lets me post big pictures and videos, and most of the design is still based around that. I’ve never been a fan of vertical rules — they always seem to claustrophobically trap content more than anything else — but I found they brought much-needed definition to the wide column, now that the graph paper is no longer there. Other elements are strong enough on their own to define the underlying grid. I’ve also added some gravity-defying page corners to bring a bit of depth to the layout. Even though Version 12 has been based significantly on my Version 11 code and design, I decided to give it a major revision number because it’s a new theme at heart. They may look similar, but they feel very different. Version 11 has been retired here. equivocality.com is now running version 11. For a person who was notorious for the frequency of his design changes, version 10 stuck around for a very long time — measured in years, not months. I’m going through a significant shift in attitude right now. For the first time in so long, I feel stable and complete, and I wanted my site to reflect this change. I’ve also been letting go of many things, and this certainly gave me the motivation to update even though I adored the previous version. I found lots of inspiration in Jin’s recent refresh, which has an extremely smooth and slick feel to it. The ironic thing is that he wanted it to be clean and polished, and told me he looked to version 10 of equivocality.com for ideas. Here I am getting ideas from his ideas from my ideas, in a wonderful creative synergy, and I think we’re both very happy with our mutual results. When Rachel Beausoleil started working on her latest album, she approached me about designing the artwork. We sat down and threw around some ideas before she even started recording, but didn’t come up with anything solid because I didn’t have a sound to go on. All I knew was that it was a medley of songs, not like her last album where the songs followed a theme. One day I came home to find a recording of the album in my mailbox, yet to be mastered. 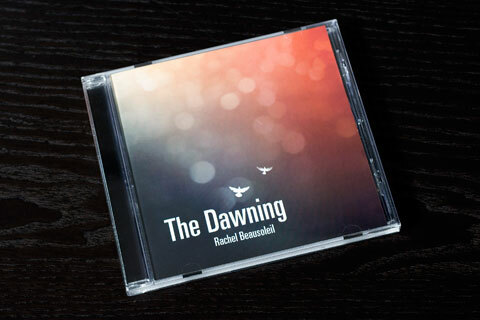 She named the album after the eponymous track, The Dawning, which is a jazz arrangement of the famous song Aquarius, a personal anthem of hers. She gave me her notes soon after, so I put on the album and gave it a good listen, feeling a certain clarity from her sound. It made me think about dawn, and space, and sunrises, and hot colours, so I incorporated those elements when laying out the text, as well as some bokeh to give an off-focus glimmer.